Lots of women suffer from PMS, but does that mean that it’s normal? Working as a naturopathic doctor has taught me that just because PMS is common doesn’t mean that it is inevitable. Natural medicine offers us many avenues for treatment; you don’t have to suffer symptoms every month. Premenstrual Syndrome (PMS) refers to the physical and psychological symptoms occurring for up to 2 weeks prior to menses, with relief from those symptoms seen after the onset of menstruation. Symptoms of PMS are many and can include mood changes, bloating, pelvic discomfort, changes in appetite/food cravings, breast swelling and tenderness, acne, cyclic weight gain and more. There are many theories about why women suffer from PMS and in reality, the reasons may vary from woman to woman. Some of these theories include abnormal hormone levels, nutrient deficiency, inappropriate diet, environmental factors, stress and also psychosocial/ cultural factors (negative attitudes about menstruation, cultural expectations about menstruation…). Naturopathic medicine to the rescue! 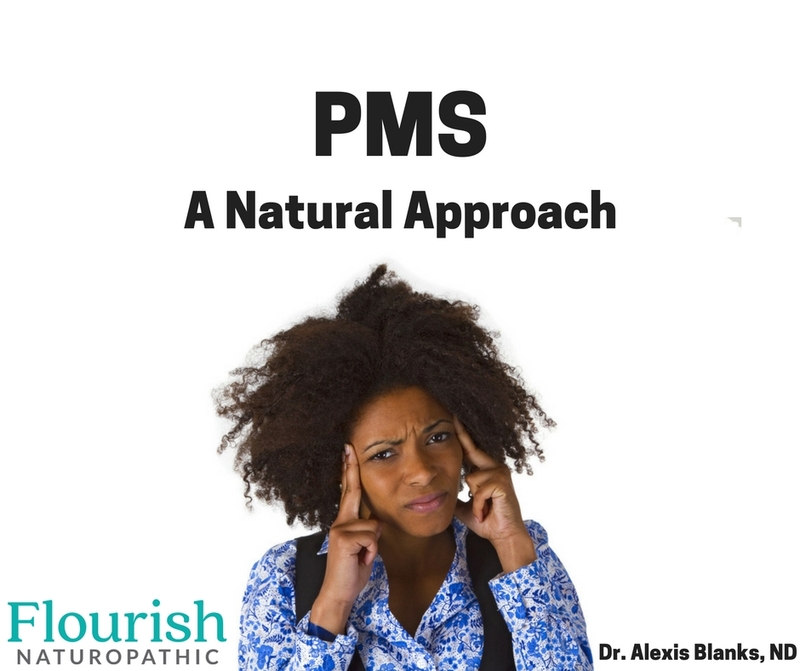 Naturopathic physicians are well suited to treating PMS and typically have excellent results. Our holistic outlook and longer visits allow us to more accurately predict which factors may be important to an individual. We take a detailed history, at times we use lab work and sometimes we will have a women track various information throughout the month to get a good picture of what is going on. In my own practice I have seen many women reduce their premenstrual symptoms, sometimes this is the focus of our treatment and at other times, this is a fortunate byproduct of our work on other issues – getting healthier often means less PMS. Diet can have a big impact on PMS. A healthy diet full of nutrient rich vegetables and healthy protein with limited refined carbohydrates will help control blood sugar and curb cravings leading up to menstruation. Finding a diet that’s right for you, avoiding food sensitivities and inflammatory foods will help keep inflammation in check and further help PMS. Herbs can be used to treat symptoms in the moment and also to help address the root cause, shifting our biochemistry to something more favourable. My herbal prescriptions are unique and based on the individual that I am working with. Herbal adaptogens are a class of herbs that help us deal with stress and the hormonal imbalance that can come as a result. Examples include Withania and Rhodiola. Each herb has its own unique set of characteristics that help me know what herb to use. For example, Withania can help with thyroid issues and Rhodiola is great for poor sleep and anxiety. Chaste Tree is one of my favourite herbs for PMS and hormone regulation. It is thought to work on the pituitary, a gland in our brains, influencing our hormones to help increase our progesterone levels and decrease symptoms of PMS. I would not normally use this if a woman was taking prescribed hormones such as the birth control pill. Lavender is an example of many herbs that I might use for the anxiety, irritability and depression that comes with PMS. When it comes to PMS our herbal medicine chest is overflowing with useful remedies! Some vitamins and minerals have been shown to help with PMS. Vitamin B6 is one such example as it is thought to help increase several neurotransmitters (important communication chemicals) in the brain and in this way, help PMS. Magnesium is another nutrient that has been shown to help with PMS-related pain. It’s not often that I need to resort to prescription hormones to help with PMS but there is a time and a place for this. If needed, a go to plan would be natural bio identical progesterone cream used in accordance with the woman’s cycle (this is not effective for contraception). Dr. Alexis Blanks is a naturopathic doctor who is clinically trained and naturally focused. She is co-owner of Flourish Naturopathic at Moss Street Healthcare Centre. Learn more at FlourishND.com.